Did you know that, by 2019, video content will account for roughly 80-90% of internet traffic? According toa Cisco study (‘Video Highlights’ section) user-generated video usage will increase exponentially. The explanation is quite simple: the World Wide Web is teeming with interesting and useful Information, from news articles to trending topics. But storytelling is evolving. Gone are the days when the Internet was exclusively text based. The same way magazines and newspapers started making room for television and radio, so will the Internet make room for video. This doesn’t mean that written content will disappear altogether. Not even close. In order to truly empower your online efforts you must strike the perfect balance between enticing videos and written content under the form of transcripts, translations or captions. There are a number of reasons why these forms of written content are important. First of all, they make it possible for deaf people or those who are hard of hearing to enjoy videos. Secondly, studies have demonstrated that transcripts appeal to students & learners. The third, and probably most important aspect of written content for videos, is related to SEO. Search engines such as Google cannot watch a video the way we do. They must crawl the text information provided through keywords, descriptions and tags. Although the fundamentals of traditional SEO also apply for video SEO, the strategies for the latter are inherently different. According to Google, web-pages and content must be created with the user in mind. Videos accompanied by transcriptions or captions bring the human element back into an over-technologized world. Using transcripts on a video can help you increase the keyword diversity of your media content, thus making it possible to appear on SERPs for multiple terms. Granted, transcribing isn’t the easiest job in the world – it seems that a one-hour interview takes around 4-6 hours to transcribe – but seeing as videos are becoming increasingly popular, it appears to be one of the best ways to move forward in an ever-changing digital landscape. Discovery Digital Networks tested this theory out by adding captions to YouTube videos and reported a 7.32% life-time increase in views and a growth of 13.48% in only two weeks (*). In addition to this, they also started ranking for search terms that weren’t included in their tags, descriptions or titles. There are plenty of case studies that prove the effectiveness of using transcripts, captions and translations for SEO. 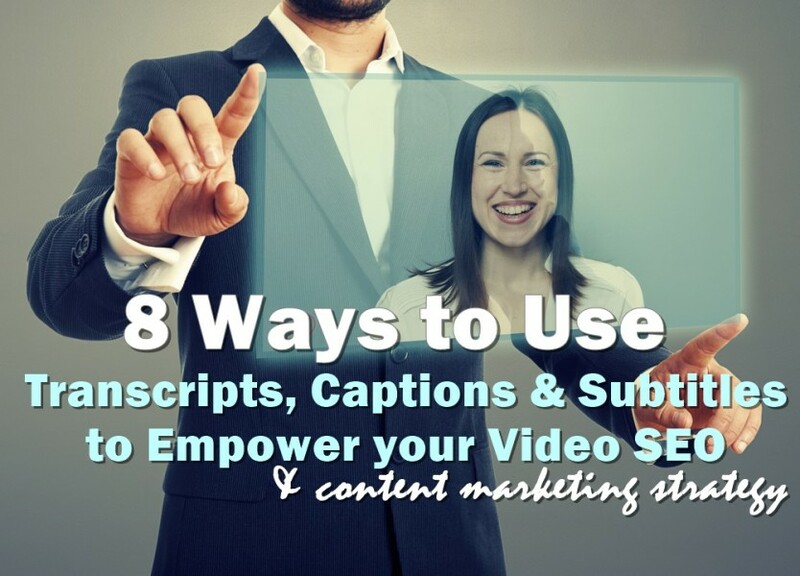 With these things in mind, let’s take a closer look at a few Video SEO strategies that maximize the potential of transcript and caption usage. Let’s say that you’re trying to build a video landing page around the keyword “whirlpool refrigerators”, but your video is actually about “whirlpool refrigerator water filters”. 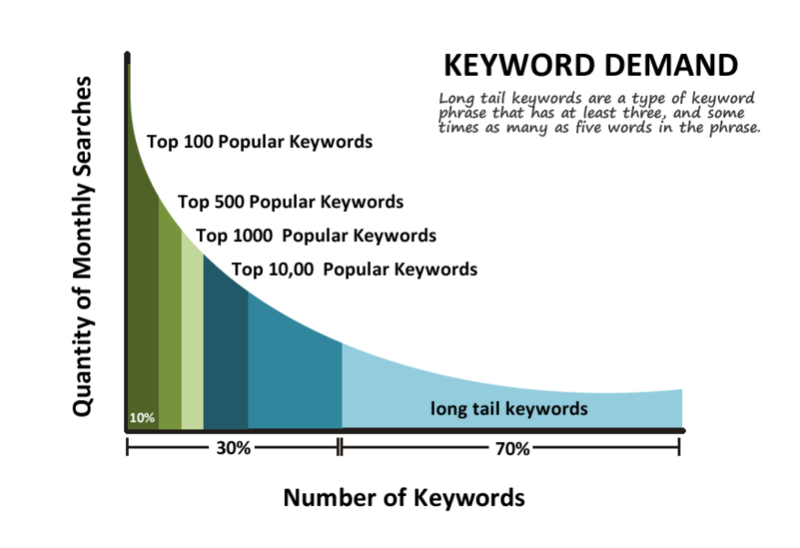 Naturally, the long-tail version of the keyword will be repeated in the video a lot. You can adjust your meta-description, titles tag and other tags to match this key-phrase. This will add more relevancy to your video and attract targeted traffic that is more likely to convert or take action. The general rules would be to keep titles shorter than 66 characters (point at which they get truncated), meta-descriptions under 166 characters, and tags under 120 characters. Needless to say, keyword phrases that are not aligned with the content on your page might result in confusion and dissatisfaction on the visitor’s behalf. The strategy of building from the bottom up by focusing on long-tail keywords that are relevant for a specific industry or topic (like refrigerator) will send positive signals to Google. In addition to this, Internet users rarely search for something that they are genuinely interested with short tail keywords. They will generally use at least 3 to 4 words for their searches. Having a page that answers their specific problem represents a huge plus. 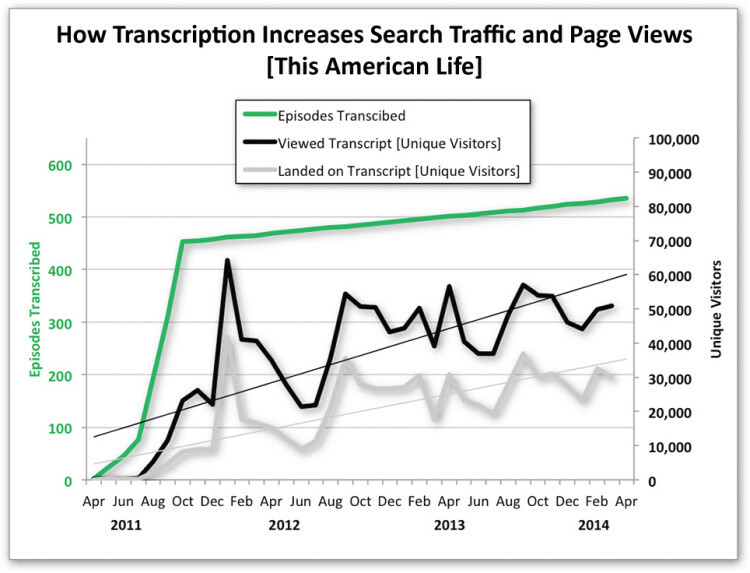 Transcriptions and videos can be created to naturally include long tail keywords. Engagement level is one of the most important metrics for determining the quality of content. This is even more true when we are talking about videos. You have probably heard about Google’s “Time Watched” algorithm that rewards videos which have longer watch time. Furthermore, 94% of the students that responded to a 2012 study with MIT’s OpenCourseWare said that interactive video transcript is ‘useful’ because it enables them to stay focused, and learn at their own pace, in multi-sensory mode. A high percentage of popular videos are designed for educational purposes, be they simple software guides, or full courses, and knowing that transcripts increase completion rate of videos by 40 to 80 percent is encouraging. You should take the time to write compete & correct transcripts for every video you release to increase watch time and visibility on SERPs. Captions can also be incorporated into videos to provide extra information or to direct visitors to some of your other relevant videos. 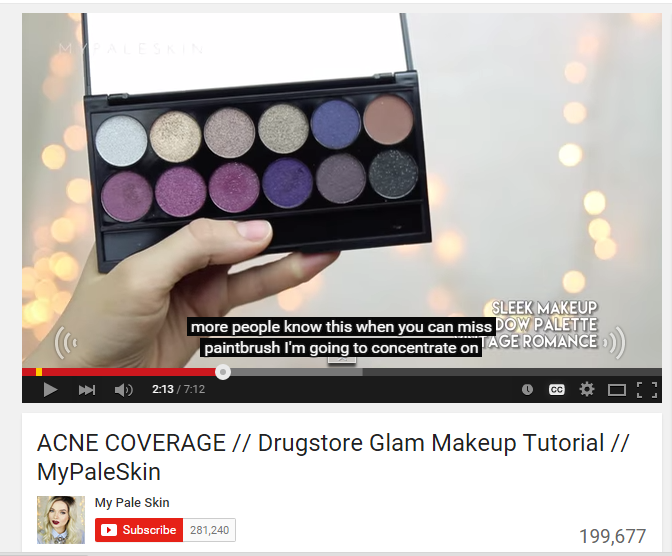 Are you familiar with YouTube’s auto-caption function? If you’ve been using it until now you should know that it is usually riddled with errors. That’s because the platform’s speech recognition tool is influenced by background noise, vocabulary and accents. From a SEO point of view they are useless because they are not indexed in either Google or YouTube. If you want to make your captions matter you must upload them yourself. The search engine sees them as trustworthy and relevant, and as such, it will index them. Most video platforms such as YouTube and Vimeo have a Description box where you can write a few words about your video. This is the place where you want to place your transcript. 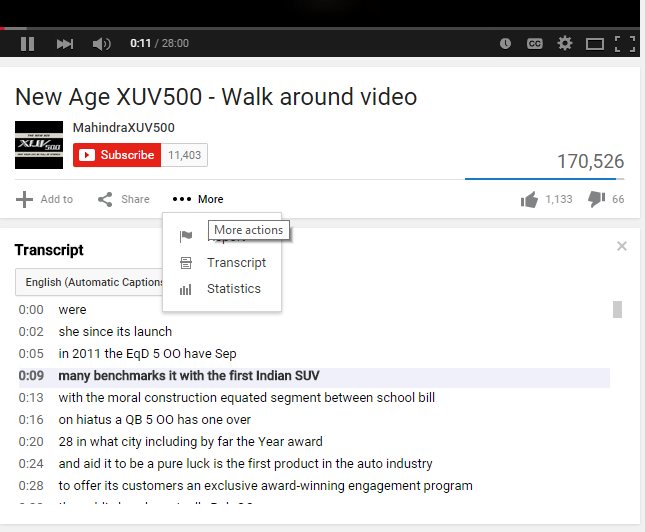 Make sure you add a short summary of the video before pasting your transcript. Make the summary short and concise to let viewers know what they should expect to see. Also keep in mind that most descriptions are limited to 5,000 characters (around 800 words), so pasting transcripts is only possible for shorter videos. If you’re working with longer videos you should fragment your transcription into important phrases that also contain your long-tail keywords, or embed the video in a blog-post that includes the full transcript. There’s a fundamental difference between video captions and transcripts. Each has its strengths and weaknesses. 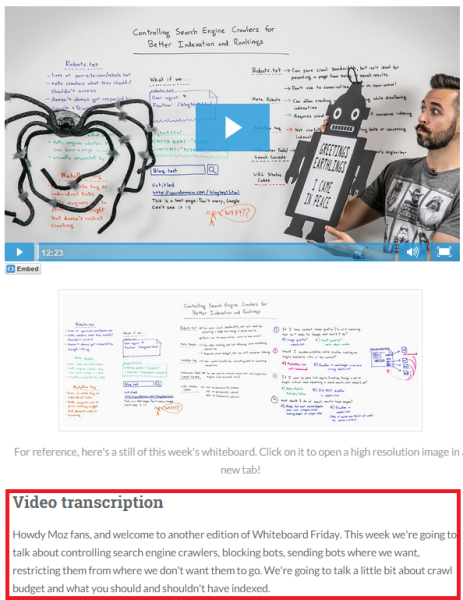 Transcriptions represent the text-version of a video added under the video or in a separate blog post. Captions appeared as a solution for deaf or hard of hearing users, but it requires them to watch two streams of video at the same time: the rolling captions as well as the video. Video captions are extremely beneficial for user-engagement because they enable YouTube to index a word exactly when it is said. In other words, viewers can use it to jump directly to certain moment in the video. This deep linking will increase the watch time of your videos and ultimately bring more relevant traffic to your website. According to recent studies, less than 20% of YouTube viewers are from the United States. By creating multilingual subtitles you can attract non-English speakers. Another plus would be the fact that translated content isn’t considered duplicate by search engines. Go to your Google or YouTube analytics tab to find out more about your site’s demographics. If you have followers from different corners of the world you should consider creating multilingual subtitles to improve their experience. 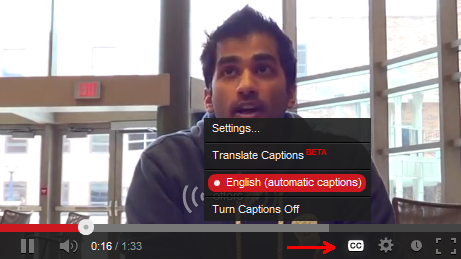 You can have your captions translated and uploaded to YouTube from the transcripts and captions menu. This will make it easier for you to rank on non-English search pages as well. As we mentioned earlier, transcripts can be included in the video’s description or in a separate blog post. But these aren’t the only practices that you can try. For example, transcripts can also be implemented through a video schema mark-up, or enhanced with interactive properties. 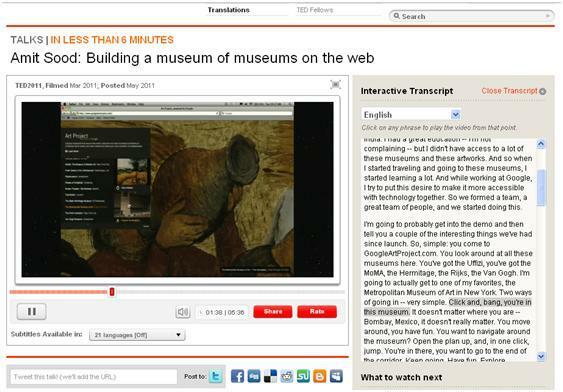 Interactive transcripts represent one of the newest forms of media consumption, and are usually displayed next to the video or audio source. There are two major categories of interactive transcripts: those that highlight specific words as they are spoken, and “Ted Talks” which highlight an entire paragraph. Both are designed to increase retention of material. Some of the best providers for interactive transcripts include Pop Up Archive, 3Play Media and ProTranscript. You could also try to use a captions plugin or to add your captions in HTML5. If you have longer videos you should always post the transcript on a separate page and make sure to include it in your video sitemap, otherwise the search engine will think that it is a text page rather than a video one. Our last piece of advice refers to derivate content obtained from transcripts. This tip is extremely effective for longer videos. Because the transcript is very long, and should be published separately, why not make the best of it? You can repurpose this type of content into how-to articles, guides, blog posts, eBooks, Infographics or even white papers. Add the embedded code for your YouTube at the start of your written content. Your transcripts and videos should represent the basis of your content strategy. Don’t forget to update your video sitemap every time you make a new addition.